Hand built basses are always unique but there are a few details that make this bass stand out. 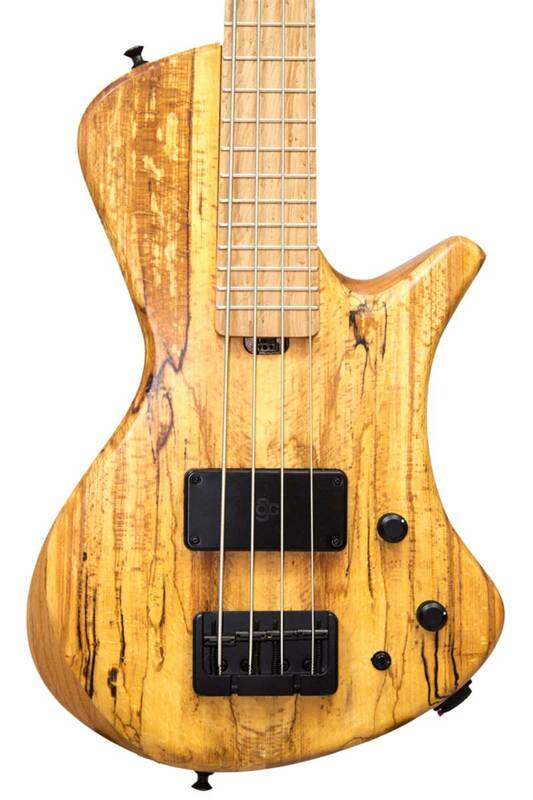 The size and weight is kept to a minimum by the 30.5″ scale length, and the 19mm string spacing makes it extremely comfortable to play for players used to longer scale basses. 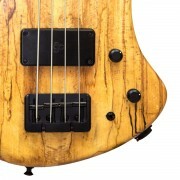 The pictured bass has a spalted beech top and pictures of the seven options for top woods are shown on the bottom tabs. Please be aware that the pictures of woods on our site are a guideline only as grains, patterns and figuring can vary greatly. We guarantee that you will receive an excellent, hand picked example of the wood you choose and we can send you a picture before work begins. The bodies are made in a grain textured, minimum lacquer finish that brings out the natural beauty of the wood. You can also choose a rosewood or acrylic impregnated birdseye maple fingerboards which are finished in satin lacquer. Acrylic impregnation is not just a surface treatment and it infuses the wood with acrylic monomers, drawing resin through the entire board. The acrylic stabilises the wood and increases its density, hardness and resistance to movement caused by moisture. 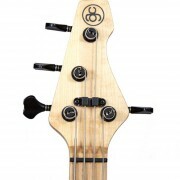 You can also upgrade your fingerboard to fretless ebony, with or without lines. Upper fret access is exceptional thanks to the lower cutaway and the 24 fret, bolt on neck which has alloy side dots. 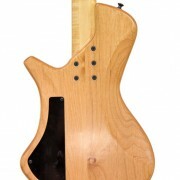 The neck has an unusual asymmetrical design which offsets its deepest part, normally the middle, to the bass side. So the bass side is a “D” profile while the treble side is shallow “C”. 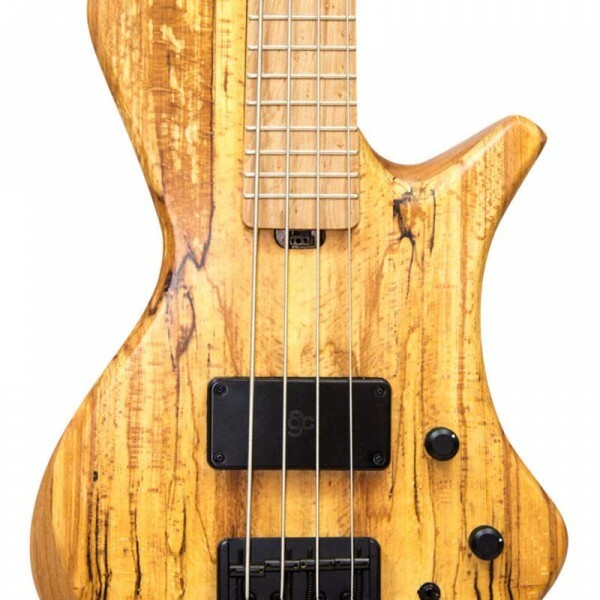 Although unconventional, the neck fits beautifully in the hand. 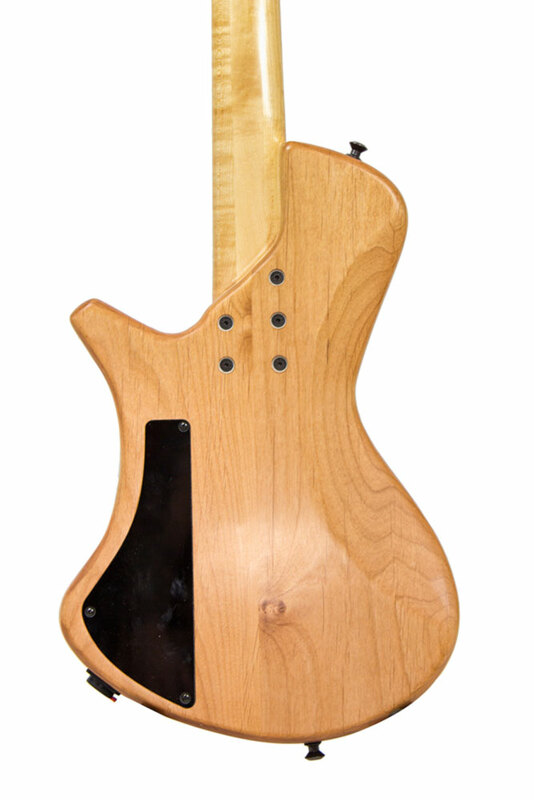 A 0″ radius, completely flat fingerboard works very well with this neck but a radius of 16″ or 20″ can be added as an upgrade option if you prefer. 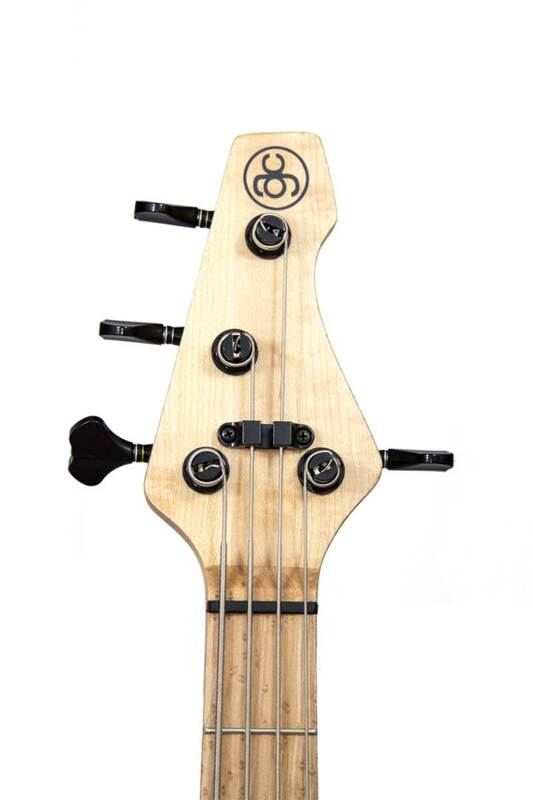 The truss rod is a dual design that is able to compensate for both forward or back bow and so allows full control over the neck. Adjustment is at the heel of the neck via a custom made stainless steel spoke wheel. The neck is further reinforced with two 6.35mm carbon rods on either side of the truss rod. This increases the stiffness of the neck and helps reduce dead spots. The single humbucker is hand made by Aaron Armstrong of Kent Armstrong and Son Pickups and is an exclusive, custom design that is not available off the shelf. The wide aperture (50mm casing) pickup offers a more aggressive, darker tone than average, with a lot of punch and a smoother high end. This is great choice for a powerful rock or extremely punchy funk tones – anything where you really want to be noticed. The 3 way switch accesses series, parallel and single coil mode, making for an incredibly versatile setup from just one pickup. If you want to go active you can add the customised ACG/East P-Retro Preamp upgrade option, which is a design exclusive to ACG basses. This is a flexible active/passive bass preamp equaliser which offers even more tonal variation without adding lots of knobs. Power is provided by a 9v battery accessed from a cover on the back of the bass. This stack works in both active and passive mode. This stack works in active mode only. Mini toggle switch: Active/Passive selector. Pulling the volume switch up activates a bright function. When the boost knob is in its centre click, there is some additional gain with a flat response. Turning the boost knob clockwise boosts mids according to the frequency knob setting. Turning the boost knob anti-clockwise boosts the bass and treble combined, with overall balance set by the frequency knob. Pulling the boost knob activates an internally preset deep boost. The Lightspeed is fitted with a Neutrik locking jack socket and a retention spring inside the jack ensures that your cable will never be accidentally pulled out, which is particularly useful when gigging.